Expired event; awaiting update on next occurrence. Event Parking: There is room to park behind the outfield fence and around the stadium. On fireworks nights, the area behind right and center field will be blocked off so that your vehicle won't suffer any damage (like being blown up). Handicapped spaces are located right out front and on the right side of the stadium. Baseball game played June 16, 2018. Fireworks after the game, weather permitting. Have you seen this Fireworks Display? Rate it! 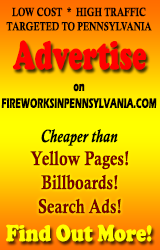 Got Fireworks Video to Share? If you've got video of one of these events, I'm happy to post it to the page. Just upload it to your YouTube or Vimeo account, and drop me a line telling me where you've uploaded and which display and when it was shot, and I'll hook it up! This is what I made with WordPress and the Genesis Framework. What can you make? I have a FAQ. If you have questions, try this document first. I'll probably be adding to it, well, frequently. 90% of the time this will probably get you your answer quicker than emailng me. You can republish my listings, but please read my Republishing page first. The short version is, I put a lot of work (and money) into this, so please don't be a jerk. Seriously. I'll find out. I always do. I also have a Privacy and Disclosure page if you care to read it.